Over-the-counter “boil-and-bite” mouthguards only provide minimal protection from sports-related dental injuries. That’s because they can be difficult or uncomfortable to wear – and may interfere with breathing or speaking. As a result, you might not wear them as often as you should, putting you at greater risk for tooth loss or damage. Custom-fitted mouthguards are the solution. They’re crafted from top-quality plastics and designed to fit your mouth perfectly, so they’re more durable and comfortable. That means you’re more likely to use them consistently, and therefore get the protection you need. In just 2 short appointments, sometimes even on the same day, you can have your own custom sports guard! 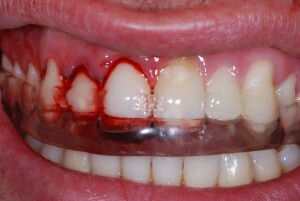 of protecting your teeth and jaw with a sports guard during contact sports. He had worn them through the years of soccer, basketball and snowboarding. But for a college pick up game he figured he’d be fine. 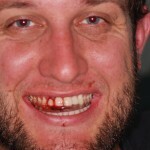 A buddy’s elbow came up and accidentally nailed him in the front teeth. Miraculously his teeth weren’t knocked out, however they were knocked enough for his shorts roots to loosen and the teeth were pushed horizontally into his mouth, he brought them forward with his thumb so he could close his mouth and drove immediately to my office. 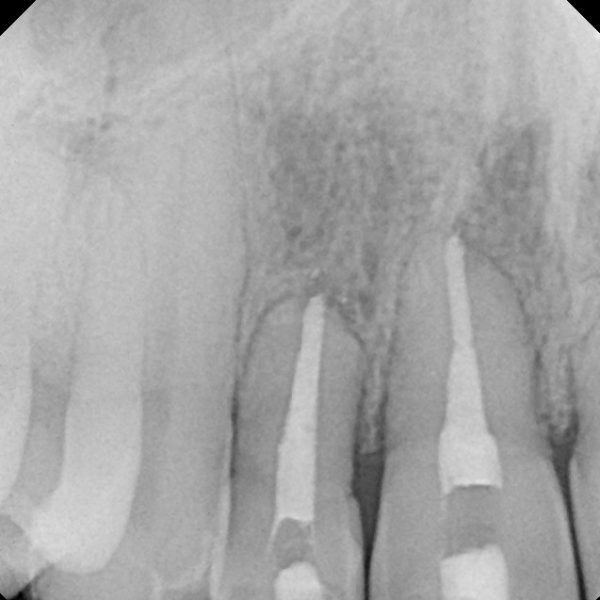 After emergency triage treatment and wearing a guard for a year his teeth have remained in place, but eventually he will loose them and implants will be placed. Moral of the story: Have a custom fit sports guard made and wear it! It not only protects your teeth but also your jaw during sports collisions. 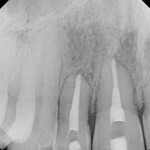 Teeth were ‘taped’ together and a guard was worn 23/7 for an entire year.